Included: Photographic tuition and refreshments. Not Included: Any travel required to and from the start point at Leitrim Lodge car park located directly off the Sandbank Road. We'll be returning to the same spot at the end of the workshop. 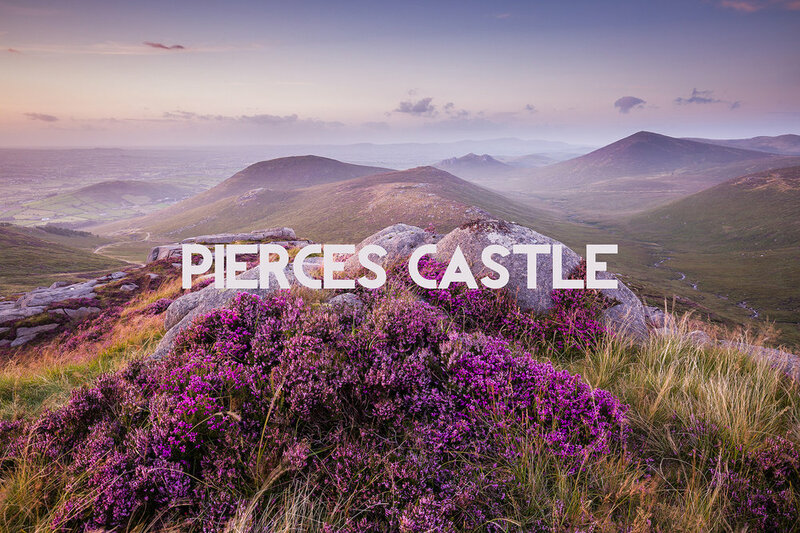 Pierce’s Castle is the jewel in the western Mournes- an area characterised gentle rolling hills. Purple heather at this time of year brings even greater vibrancy to already beautiful views. Between shooting and enjoying a few hot drinks, I’ll be sharing some of my own experiences. As part of this workshop you’ll also be receiving a 60 page e-book assembled by Alistair Hamill, Stephen Wallace and myself. This is the start and ending point for the day. I’ll formally introduce myself and share with you the plan for the evening. We'll begin the gentle walk up towards Pierce’s Castle which takes approximately 50 minutes with a couple stops for a break along the way. I’ll discuss photographic technique and share with you some thoughts on composition and how best to frame the views of the valley. We’ll have 2-3 hours up here which is plenty of time adequately prepare ourselves for a sunset shoot facing down towards Hen mountain. We begin the walk back down, arriving at Leitrim Lodge car park at 9:15pm. 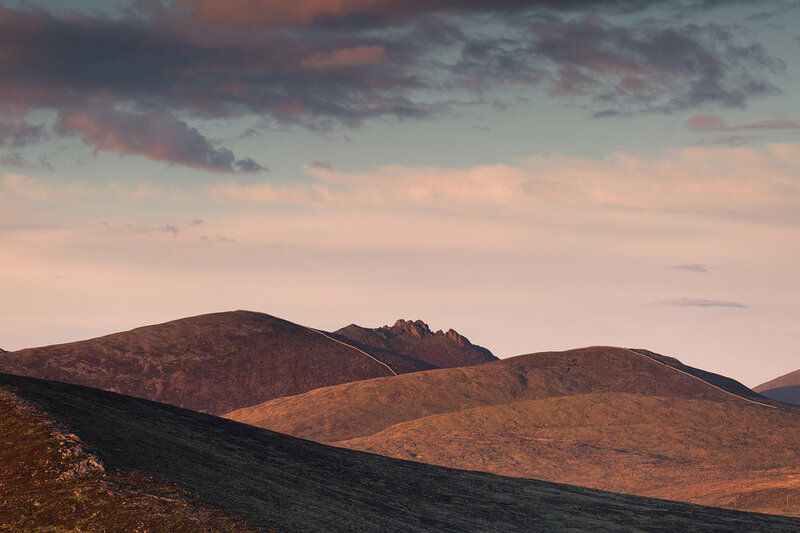 The Mournes generally have their own micro-climate making conditions sometimes unpredictable. As a rule of thumb, prepare to over-dress rather than under-dress as even during a summer's day temperatures can quickly plummet on higher ground. You'll need a base layer (t-shirt, long or short sleeved), a mid-insulating layer (warm fleece) and an outer layer (hard or soft shell jacket) for protection from the elements. A waterproof layer is essential. Please also bring a head torch. Whilst it will still be bright as we begin walking down, closer to the finish it may become dark. The paths we'll be leading you up are well defined, however the terrain is often rocky and uneven. With this in mind, bring appropriate footwear i.e. walking or hiking boots. The less equipment and the lighter the backpack, the better. Typically I carry two lenses, a 16-35 f4 (for wide angle photography) and a 70-200 f4 (for zooming in). Whilst I do carry filters, these are not strictly necessary- I would recommend at minimum bringing a polarising filter. We'll explain the benefits of shooting with and without filters when we're on location with you. Please make yourself aware of the Terms and Conditions before participating in the workshop. Payment confers acceptance of this. The price of the workshop is £60 which is payable in full upon booking. To participate, please follow the link where you'll be re-directed to a check-out page.